Crater lake is a caldera lake formed by the collapse of land after a volcanic eruption and is the main attraction of Crater lake national park. It is located in the state of Oregon. Crater lake is the deepest lake in the United States. Visiting this deep blue lake in May is a good idea; even though, the rim drive is not fully open. West rim is open by May, and there is enough snow and ice around to contrast the mysterious-blue of the lake and the clear blue sky. East rim is usually open by July second week. Rim village visitor center can be covered in snow, and a good photo-op. We stayed at Prospect historic hotel B&B in Prospect, a small town located 28 miles from the national park. In Prospect, there are a few waterfalls like Mill creek and Pearsony falls within a short hiking distance. People at the reception will gladly help you with a map and details to get to these falls. Make a reservation for a quiet candle-light dinner here; food is really good. 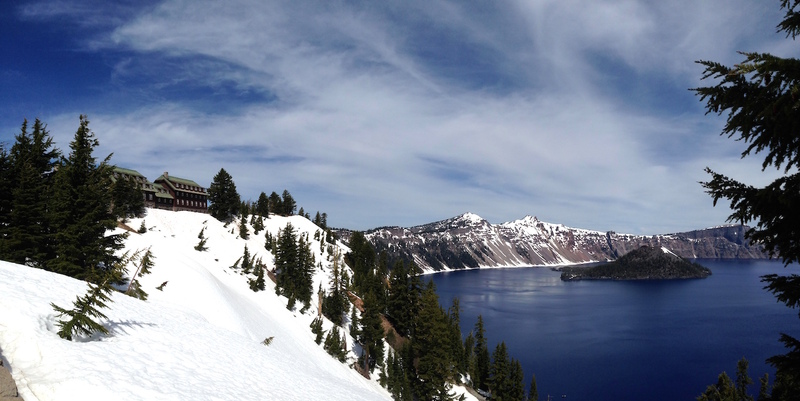 According to me, the best place to stay would be Crater lake lodges. But reservations need to be made months in advance. Another option is to stay at Klamath Falls, a small city, about 45 minutes drive from Crater lake. Start your day with a sumptuous breakfast at Crater lake lodge dining room. Then, drive on West rim, park your car, walk or snowshoe around, hike to Watchman overlook, and soak in the beauty. Since the East rim drive is usually closed until July, it is not possible to hike down the Cleetwood trail for a swim in the lake or a boat tour of the volcano. Thank you Ruchi. 🙂 I’m sure you too would have loved the lake even with all the snow around. Amazing! I really really want to go. Yeah you should, it’s very beautiful.